To become a core institution for promoting industry-academia cooperation & personnel training in agriculture and biotechnology industry. To promote industry-academia cooperative research and personnel training and to enhance competitive ability in agriculture and biotechnology industry by combining universities, research institutions, Pingtung Agricultural Biotechnology Park (PAPB) and PAPB enterprises. I. To build up a global agricultural biotechnology core area by combining universities, research institutions, PAPB and PAPB enterprises. III. To facilitate the planning of PAPB industrial development, to promote innovative research and development and to train talents. IV. To assist the establishment of high-tech environment in PAPB and to promote the establishment of national laboratories and research centers. V. To promote the technology development in agricultural and biotechnology industry, talent training, business management and market development. Our training policies include developing courses for industrial needs, providing professional training services, improving technical and human quality, fulfilling training quality management system and ensuring the training performance. Based on the spirit of TTQS, we put our efforts in increasing professional training quality and providing diverse courses and satisfied services in order to promote individual career competitive ability for our members. We provide abundant resources and training environment so that our members are able to gain diverse techniques and knowledge as the foundation for improving industrial competitive ability in order to carry out their tasks effectively. ROCAIC has 21 directors and 5 supervisors. Board of Directors and Board of Supervisors have been established separately. ROCAIC has 75 group members, including 29 school members, 10 research and corporation members and 36 enterprise members. There are 198 representatives. 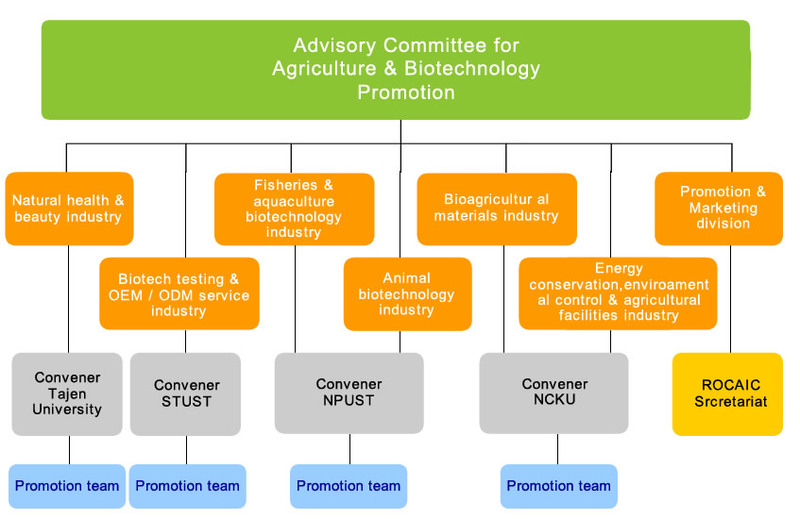 Our main tasks include promoting our tasks and industrial-academia cooperation and setting up Advisory Committee for Agriculture and Biotechnology Promotion. © 2016 ROCAIC. All Rights Reserved. Design by ENVISAGE.